Now, most people travel to Venice for the canals, the romance, the architecture or the history. For me, it was the crabs. No, not carbs – crabs. Not many people (including some Venetians) know that early summer in Venice means moeche: soft-shell crabs from the lagoon, that have been harvested for about 300 years and are a delicacy on a par with white truffle. The crabs are closely monitored during the season, and as soon as they start to “moult” they are removed from the water, cleaned and quickly transferred to the market, where they sell for upwards of €25 a kilo to hungry locals and restaurateurs. And the odd tipped-off foodie traveller with a voracious appetite for seafood. Venice, the capital of northern Italy’s Veneto region, is steeped in history, from tales of Casanova to the debauched goings-on of Pope Alexander VI. With no roads, just canals, including the Grand Canal thoroughfare, the 18 small islands of Venice are lined with Renaissance and Gothic palaces that give this city its distinct character. One of these palaces was to be my first port of call on my trip in the form of Palazzo Venart. These little crabs are delicious, intensely briny in flavour, and are perfect as part of the classic Venetian fritto misto, along with other seasonal delicacies such as anchovies, squid and mantis shrimp – or simply on their own, as served at Al Ponte Del Megio. This beautiful Venetian palace once housed some of the city’s most respected figures, and has hosted many events and parties for the elite and the privileged. 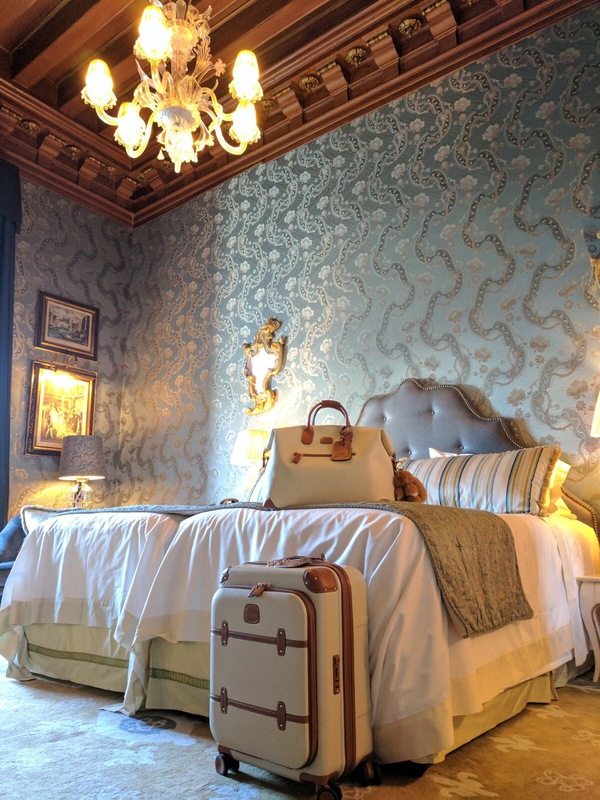 Surrounded by the highest standards of Venetian craftsmanship and style, including fine art from the building’s past and amazing period features and fittings, this boutique hotel offers an intimate and atmospheric stay. Upon embarking the Alilaguna at Santa Croce the hotel is a mere two minute walk down the cobbled streets; there is an option to arrive via private water taxi transfer to the hotel’s garden entrance, arranged on request. Once inside the big iron gates it feels more like a grand private home than a hotel, and this theme runs throughout the property, with a lounge on the first floor where guests can relax with evening drinks and a private garden overlooking the grand canal. I was shown to the Christine de Pizan Suite, named after the first famous female author in the world, who resided in Venice in the second half of the 14th century. She was an intellectual and could be considered as one of the earliest feminists. Hell yeah. The suite was vast, complete with wooden wall panels, parquet flooring, ornate furnishings and breathtaking views of the Grand Canal from the separate lounge and office. The bedroom came with a king sized bed, tapestries, gold lighting and, best of all, a walk-in wardrobe, while the bathroom houses a separate bath and walk-in shower along with luxury toiletries. 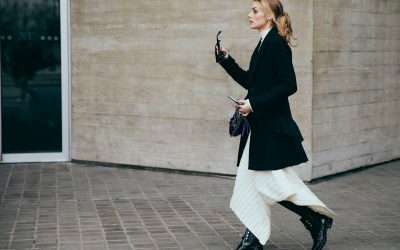 After unpacking my gorgeous Brics luggage I freshened up and headed to reception to get the low-down on the moeche situation. After some help from our friend Google, my traveling partner and I set out into the warm evening air in search of crispy crab joy. Luckily for us, three streets and two bridges later we were at Al Ponte Del Megio, a very charming restaurant located by Rio del Megio – and on special was the infamous moeche! Now this dish is not for the faint hearted: the classic preparation method involves the crabs being soaked in seasoned beaten egg, which they absorb and eventually drown in. They are then dredged in coarse flour and deep-fried until golden brown and crisp, then served with sea salt and a squeeze of lemon. 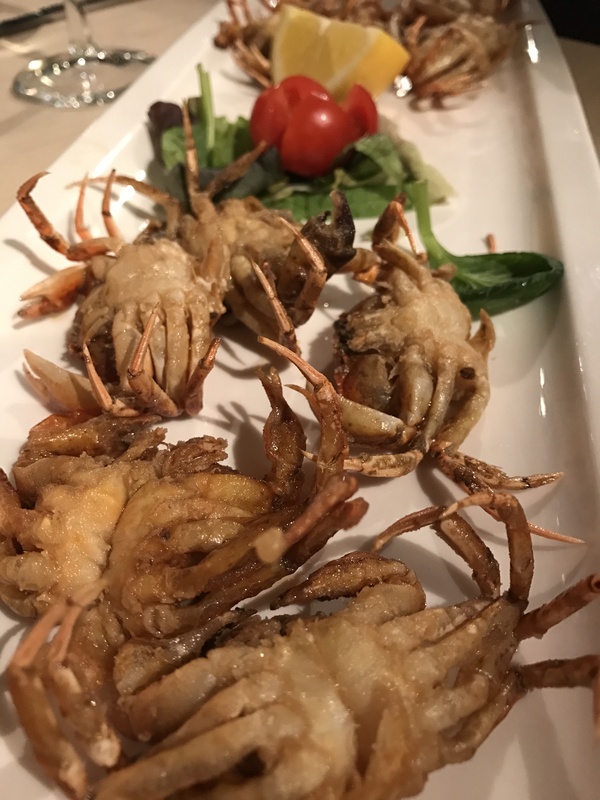 Despite their grizzly end these little crabs are delicious with an intense briny flavour and are perfect as part of the classic Venetian fritto misto, along with other seasonal delicacies such as anchovies, squid and mantis shrimp – or simply on their own, as served at Al Ponte Del Megio. 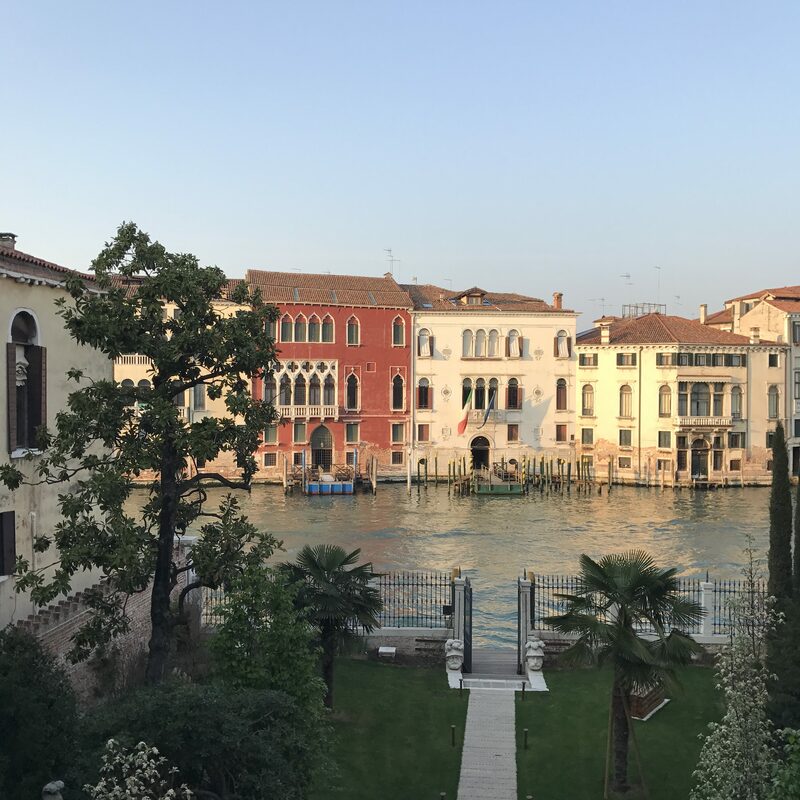 After feasting liberally on moeche (and fantastic Venetian red wine) we wandered back to Palazzo Venart for a well-earned food coma in our suites. Despite the previous night’s blow-out, as soon as we rose we headed to breakfast served at The GLAM Restaurant, the latest creation of Michelin chef Enrico Bartolini. Think tiny pastries, fresh yoghurt and eggs cooked to your preference all washed down with copious amounts of strong Italian coffee. 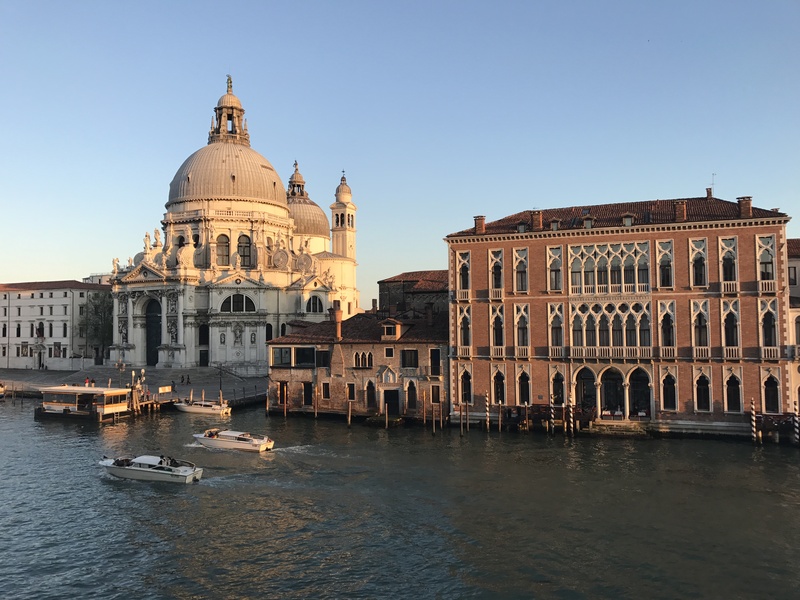 Refuelled, we headed out the gates of Palazzo Venart and out to the central square, Piazza San Marco, which contains tourist favourites St. Mark’s Basilica, the Doge’s Palace and the Campanile bell tower offering views of the city’s red roofs and waterways. Instagram heaven. The square also houses some of Venice’s best museums – the Museo Correr has a great view of the square from the first floor restaurant, as well as some great pieces of historical art and antiques. A word to the wise: avoid the cafés in this square, they’re a tourist trap and you need only go one street over or so to find a better deal on lunch or aperitifs. Venice is much more than just the obligatory Piazza San Marco and Rialto Bridge. My advice is to just get lost. Take that suspect looking right turn that looks to be a dead end as you may find a hidden gem. With so many beautiful Piazzas, canals and architecturally stunning buildings, not to mention the nonchalant attitude of the locals, Venice truly feels like a world of its own. Aperol spritz at 11am? Why not! Four-hour lunch? It would be rude not to! Waste an afternoon overlooking the Grand Canal? Count me in! Whatever you do do in Venice, don’t get hung up on the “What to See” or “Top Ten” as inevitability you’ll stumble across them (Venice is really small and the public transport is really easy to use). 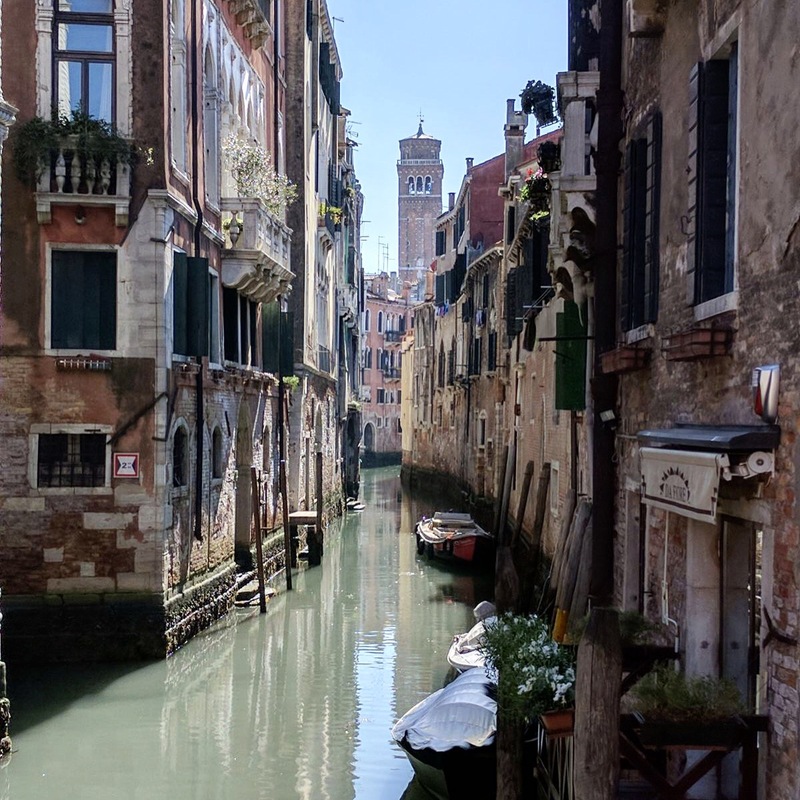 If you really want to see ‘real Venice’, spend some time during weekdays (not weekends) around the Dorsoduro area, especially Campo Santa Margherit, which is a huge student district. While here, have a cocktail at Café Rossa and hit up Café Duchamp for the sunshine. For a fantastic authentic Venetian experience go to Campiello Del Remer between 5-7pm for a happy hour buffet of lush authentic finger food and risotto. It’s just €8 with a glass of prosecco, stunning views over the Rialto Grand Canal, and zero tourists. 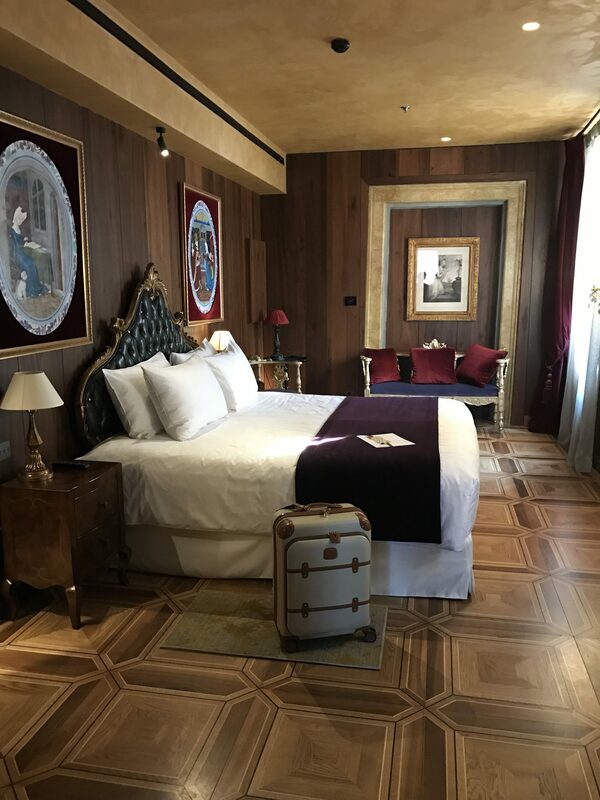 However, if money is no object and you are after an out-of-this-world five star experience with all the glitz and glamour of a bygone era of Venice, then there is only one place for you: The Gritti Palace. The newly restored hotel features 61 luxurious guestrooms and 21 sumptuous suites, including suites with impressive canal views. Cloaked in rich period colours, all rooms feature local design elements including Venetian tapestries and velvets, unique pieces of furniture such as Rococo couches, handcrafted gilded mirrors and Murano glass chandeliers. Our room was frankly mind-blowing, with a canal view from the balcony and a stunning interior in muted tones of blues and aquamarine. The pièce de résistance was the freestanding bath in the room with views of the canal and the bank beyond . . . romantic, much? Bologna’s nicknames neatly sum it up: “La Grassa” (The Fat – that rich cuisine including Bolognese), “La Rossa” (The Red – for its traditional political leanings and its ochre roofs) and “La Dotta” (The Learned – its university has a good claim to being the world’s oldest). The Gritti Palace is also home to the famous Club del Doge restaurant, which celebrates Venetian culinary traditions and is set on the famous terrace overlooking the Grand Canal. The restaurant continues to be the social hub of Venice and is designed to bring back memories of the elegant wooden decks of Italian yachts of the 1930s. Our dinner was as sublime as our stay; the staff were so attentive to every request (including a cheeky cheese course) and the food was spectacular both in taste and presentation. Club del Doge is the perfect restaurant for a celebration or special date (especially if a certain question is to be popped) – and definitely worth the price. Next stop: Bologna. The capital of the Emilia-Romagna region is super easy to get to from Venice; we took the train that goes from Venezia Santa Lucia direct to Bolgona Central, in just over an hour. Piazza Maggiore is a sprawling plaza lined with arched colonnades, cafés and medieval and Renaissance structures such as City Hall, the Fountain of Neptune and the Basilica di San Petronio. Without Venice’s gondolas, Rome’s ruins and Florence’s acres of galleries, Bologna has stayed off Italy’s well-beaten tourist track… which is why it is so worth a detour. 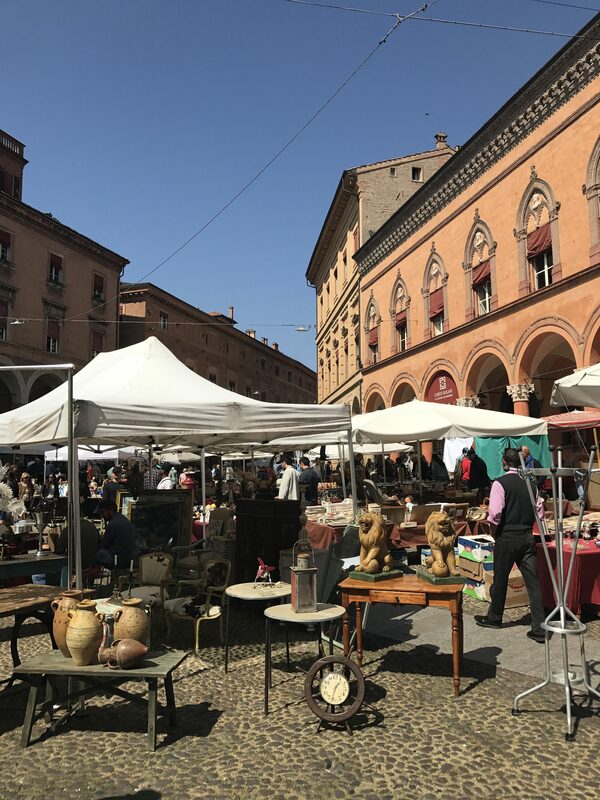 Bologna’s nicknames neatly sum it up: “La Grassa” (The Fat – that rich cuisine including Bolognese), “La Rossa” (The Red – for its traditional political leanings and its ochre roofs) and “La Dotta” (The Learned – its university has a good claim to being the world’s oldest). We arrived on a sunny day to find the town bustling. Passing the book fair by the central station, we made our way to the boutique Hotel Corona D’oro located right in the middle of the city’s architectural wonders. After checking into our room we headed towards the Two Towers, which loom over Piazza di Porta Ravegnana, to Piazza Maggiore to see the world’s largest medieval cathedral, Basilica of San Petronio, which is dedicated to the fifth-century bishop and patron saint of the city. Take some time in this square; it is particularly beautiful around sunset with an aperitif in hand watching the masses milling past. Another impressive point of interest is Piazza Santo Stefano, where you will find the Basilica Santuario Santo Stefano: a complex of seven churches from different ages founded by Bishop Petronius in the fifth century on the site of the ruins of an ancient temple to the goddess Isis. Also in the square, depending on the day of the week, you will find a great antiques market, perfect for a unique holiday memento. 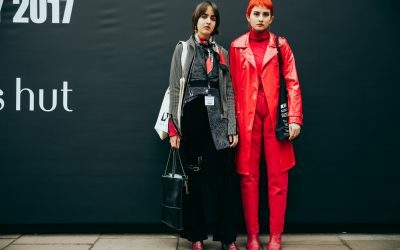 If shopping is your thing then also check out Via dell’Indipendenza, which homes superbrands such as Louis Vuitton and Hermès as well as Italian boutiques specialising in leather and other fine materials. But down to the important bit: food. A very popular pastime in Bologna is aperitivo, where bars and bistros serve small bites to patrons who purchase a drink; you could easily go dinner free and just pick at the offerings at the many bars across Bolgona. 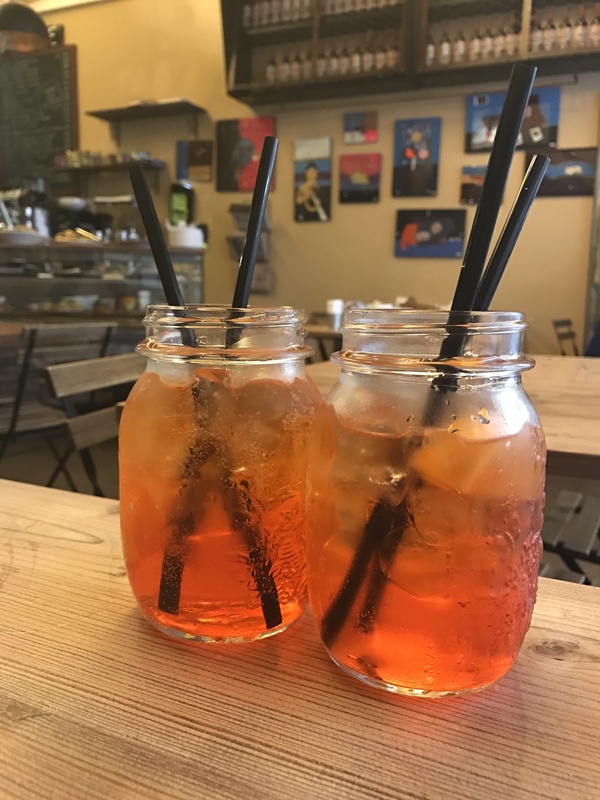 One particularly good spot is Cocoa Bistrot, open from 09.30 to 02.00, located just round the corner from Hotel Corona D’oro (easy staggering distance after one too many Aperol spritz). If you do want a proper restaurant, check out Osteria dell’Orsa – arrive early as otherwise you are in for a long wait. First come first served, this place is popular with tourists and locals alike, and no wonder. We sat outside and ordered the cheese plate, a pasta dish each and a bottle of red and the bill was less than €20. Despite the crowd everybody gets served efficiently, and with the tables packed so close together you inevitably make new friends as you compare food notes and maybe even share a glass of wine. With Bologna being a university town, there are lots of affordable options for dinner; most are first come first served, so best get in early before the Italians and then head to a bar afterwards to mingle with the locals. With its beautiful eclectic architecture, amazing food and buzzy vibe, Bologna is a surprisingly underrated destination. It’s easily doable in a day but to really immerse yourself in the culture, stay a few nights and experience the nightlife. You won’t regret it – and neither will your wallet. Your waistline, however, is another story.